There is a great need for contributions to Salt and patches are welcome! The goal here is to make contributions clear, make sure there is a trail for where the code has come from, and most importantly, to give credit where credit is due! There are a number of ways to contribute to Salt development. 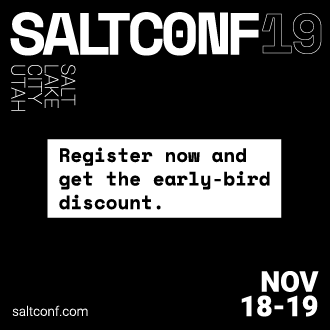 For details on how to contribute documentation improvements please review Writing Salt Documentation. SaltStack has its own coding style guide that informs contributors on various coding approaches. Please review the Salt Coding Style documentation for information about Salt's particular coding patterns. Within the Salt Coding Style documentation, there is a section about running Salt's .testing.pylintrc file. SaltStack recommends running the .testing.pylintrc file on any files you are changing with your code contribution before submitting a pull request to Salt's repository. Please see the Linting documentation for more information. There are two pylint files in the salt directory. One is the .pylintrc file and the other is the .testing.pylintrc file. The tests that run in Jenkins against GitHub Pull Requests use .testing.pylintrc. The testing.pylintrc file is a little less strict than the .pylintrc and is used to make it easier for contributors to submit changes. The .pylintrc file can be used for linting, but the testing.pylintrc is the source of truth when submitting pull requests. Sending pull requests on GitHub is the preferred method for receiving contributions. The workflow advice below mirrors GitHub's own guide and is well worth reading. Add saltstack/salt as a git remote. Create a new branch in your clone. A branch should have one purpose. For example, "Fix bug X," or "Add feature Y". Multiple unrelated fixes and/or features should be isolated into separate branches. If you're working on a bug or documentation fix, create your branch from the oldest supported main release branch that contains the bug or requires the documentation update. See Which Salt Branch?. If you're working on a feature, create your branch from the develop branch. Edit and commit changes to your branch. Write a short, descriptive commit title and a longer commit message if necessary. If your change fixes a bug or implements a feature already filed in the issue tracker, be sure to reference the issue number in the commit message body. If you get stuck, there are many introductory Git resources on http://help.github.com. Push your locally-committed changes to your GitHub fork. Do NOT perform a git pull or git merge here. Instead, add --force-with-lease to the end of the git push command to get the changes pushed to your fork. Pulling or merging, while they will resolve the non-fast-forward issue, will likely add extra commits to the pull request which were not part of your changes. Find the branch on your GitHub salt fork. Open a new pull request. Review that the proposed changes are what you expect. Write a descriptive comment. Include links to related issues (e.g. 'Fixes #31337.') in the comment field. Salt project members will review your pull request and automated tests will run on it. Make the new changes in your local clone on the same local branch. Push the branch to GitHub again using the same commands as before. New and updated commits will be added to the pull request automatically. Feel free to add a comment to the discussion. Pull request against saltstack/salt are automatically tested on a variety of operating systems and configurations. On average these tests take 30 minutes. Depending on your GitHub notification settings you may also receive an email message about the test results. Test progress and results can be found at http://jenkins.saltstack.com/. There are three different kinds of branches in use: develop, main release branches, and dot release branches. All feature work should go into the develop branch. Bug fixes and documentation changes should go into the oldest supported main release branch affected by the the bug or documentation change (you can use the blame button in github to figure out when the bug was introduced). Supported releases are the last 2 releases. For example, if the latest release is 2018.3, the last two release are 2018.3 and 2017.7. Main release branches are named after a year and month, such as 2016.11 and 2017.7. Hot fixes, as determined by SaltStack's release team, should be submitted against dot release branches. Dot release branches are named after a year, month, and version. Examples include 2016.11.8 and 2017.7.2. GitHub will open pull requests against Salt's main branch, develop, by default. Be sure to check which branch is selected when creating the pull request. The develop branch is unstable and bleeding-edge. Pull requests containing feature additions or non-bug-fix changes should be made against the develop branch. If you have a bug fix or documentation change and have already forked your working branch from develop and do not know how to rebase your commits against another branch, then submit it to develop anyway. SaltStack's development team will be happy to back-port it to the correct branch. Please make sure you let the maintainers know that the pull request needs to be back-ported. The current release branch is the most recent stable release. Pull requests containing bug fixes or documentation changes should be made against the oldest supported main release branch that is affected. The branch name will be a date-based name such as 2016.11. Bug fixes are made on this branch so that dot release branches can be cut from the main release branch without introducing surprises and new features. This approach maximizes stability. Prior to tagging an official release, a branch will be created when the SaltStack release team is ready to tag. The dot release branch is created from a main release branch. The dot release branch will be the same name as the tag minus the v. For example, the 2017.7.1 dot release branch was created from the 2017.7 main release branch. The v2017.7.1 release was tagged at the HEAD of the 2017.7.1 branch. This branching strategy will allow for more stability when there is a need for a re-tag during the testing phase of the release process and further increases stability. Once the dot release branch is created, the fixes required for a given release, as determined by the SaltStack release team, will be added to this branch. All commits in this branch will be merged forward into the main release branch as well. The Salt repository follows a "Merge Forward" policy. The merge-forward behavior means that changes submitted to older main release branches will automatically be "merged-forward" into the newer branches. For example, a pull request is merged into 2017.7. Then, the entire 2017.7 branch is merged-forward into the 2018.3 branch, and the 2018.3 branch is merged-forward into the develop branch. This process makes is easy for contributors to make only one pull-request against an older branch, but allows the change to propagate to all main release branches. The merge-forward work-flow applies to all main release branches and the operation runs continuously. The merge-forward policy applies to dot release branches as well, but has a slightly different behavior. If a change is submitted to a dot release branch, the dot release branch will be merged into its parent main release branch. For example, a pull request is merged into the 2017.7.2 release branch. Then, the entire 2017.7.2 branch is merged-forward into the 2017.7 branch. From there, the merge forward process continues as normal. The only way in which dot release branches differ from main release branches in regard to merge-forwards, is that once a dot release branch is created from the main release branch, the dot release branch does not receive merge forwards. The merge forward process for dot release branches is one-way: dot release branch --> main release branch. This "merge-forward" strategy requires that the magic keywords to close a GitHub issue appear in the commit message text directly. Only including the text in a pull request will not close the issue. GitHub will close the referenced issue once the commit containing the magic text is merged into the default branch (develop). Any magic text input only into the pull request description will not be seen at the Git-level when those commits are merged-forward. In other words, only the commits are merged-forward and not the pull request text. If a bug is fixed on develop and the bug is also present on a currently-supported release branch, it will need to be back-ported to an applicable branch. These instructions do not need to be read in order to contribute to the Salt project! The SaltStack team will back-port fixes on behalf of contributors in order to keep the contribution process easy. These instructions are intended for frequent Salt contributors, advanced Git users, SaltStack employees, or independent souls who wish to back-port changes themselves. It is often easiest to fix a bug on the oldest supported release branch and then merge that branch forward into develop (as described earlier in this document). When that is not possible the fix must be back-ported, or copied, into any other affected branches. These steps assume a pull request #1234 has been merged into develop. And upstream is the name of the remote pointing to the main Salt repo. Identify the oldest supported release branch that is affected by the bug. Create a new branch for the back-port by reusing the same branch from the original pull request. Name the branch bp-<NNNN> and use the number of the original pull request. Find the parent commit of the original pull request. The parent commit of the original pull request must be known in order to rebase onto a release branch. The easiest way to find this is on GitHub. Open the original pull request on GitHub and find the first commit in the list of commits. Select and copy the SHA for that commit. The parent of that commit can be specified by appending ~1 to the end. Rebase the new branch on top of the release branch. <release-branch> is the branch identified in step #1. <orig-base> is the SHA identified in step #3 -- don't forget to add ~1 to the end! Note, release branches prior to 2016.11 will not be able to make use of rebase and must use cherry-picking instead. Push the back-port branch to GitHub and open a new pull request. Opening a pull request for the back-port allows for the test suite and normal code-review process. Salt advances quickly. It is therefore critical to pull upstream changes from upstream into your fork on a regular basis. Nothing is worse than putting hard work into a pull request only to see bunches of merge conflicts because it has diverged too far from upstream. The following assumes origin is the name of your fork and upstream is the name of the main saltstack/salt repository. Pull upstream changes into your clone. Update your copy of the develop branch. If Git complains that a fast-forward merge is not possible, you have local commits. Run git pull --rebase origin develop to rebase your changes on top of the upstream changes. Or, run git branch <branch-name> to create a new branch with your commits. You will then need to reset your develop branch before updating it with the changes from upstream. If Git complains that local files will be overwritten, you have changes to files in your working directory. Run git status to see the files in question. Repeat the previous two steps for any other branches you work with, such as the current release branch. Patches will also be accepted by email. Format patches using git format-patch and send them to the salt-users mailing list. The contributor will then get credit for the patch, and the Salt community will have an archive of the patch and a place for discussion. SaltStack uses several labeling schemes to help facilitate code contributions and bug resolution. See the Labels and Milestones documentation for more information. SaltStack runs a mention-bot which notifies contributors who might be able to help review incoming pull-requests based on their past contribution to files which are being changed. If you do not wish to receive these notifications, please add your GitHub handle to the blacklist line in the .mention-bot file located in the root of the Salt repository. SaltStack has enabled GPG Probot to enforce GPG signatures for all commits included in a Pull Request. This applies to all commits in the pull request. GitHub hosts a number of help articles for creating a GPG key, using the GPG key with git locally, and linking the GPG key to your GitHub account. Once these steps are completed, the commit signing verification will look like the example in GitHub's GPG Signature Verification feature announcement. Salt's Bootstrap Script, known as bootstrap-salt.sh in the Salt repo, has it's own repository, contributing guidelines, and release cadence. All changes to the Bootstrap Script should be made to salt-bootstrap repo. Any pull requests made to the bootstrap-salt.sh file in the Salt repository will be automatically overwritten upon the next stable release of the Bootstrap Script. For more information on the release process or how to contribute to the Bootstrap Script, see the Bootstrap Script's Contributing Guidelines.